The Noyes family of the socialist Alphadelphia Association, and the free thought community of Liberal, preserved many of the family papers and correspondence, but with the McCarthy scare in the 1950s, my Noyes grandmother, with her sister, Pansy, burned almost the entirety of the collection, fearful of exposure and retribution. 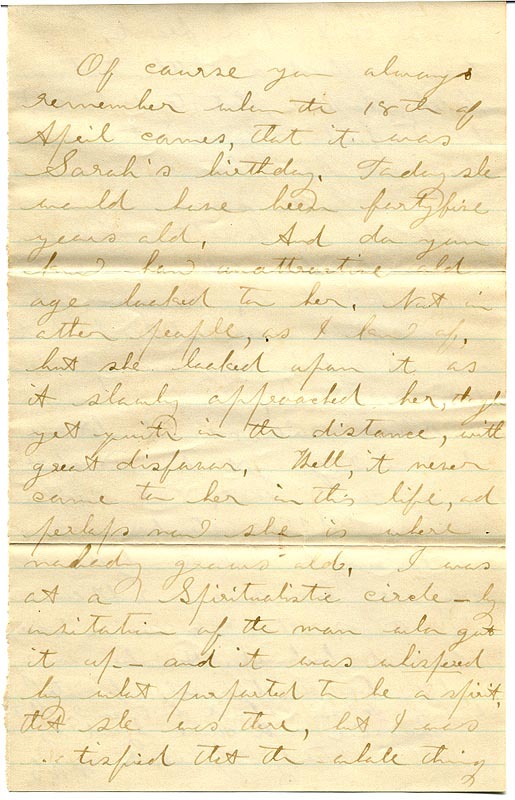 A very few letters were preserved, and it has confused me how they came to select some of the few documents that survived. Amongst a very few purely personal documents, two letters make reference to Spiritualism, one shows the link to Berlin Heights, and another concerns dream precognition. It seems that the family purged nearly all associations with socialist communities but were reluctant to discard these several documents concerning Spiritualism, and I’m glad we have them as I’ve long said that I don’t believe Spiritualism was a sudden and drastic change in the direction of the free thought community of Liberal, but that there was an enduring interest in some members of its community beforehand. 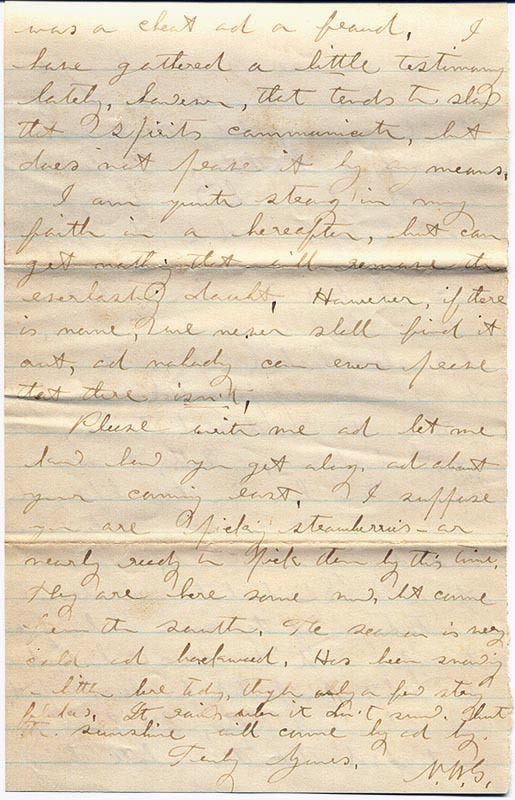 That prior interest is evidenced in the below letter written by Norman Gilbert to his sister-in-law Caroline Atwell Noyes. Liberal wouldn’t be founded until 1880. Settlement wouldn’t begin until 1881. Caroline was still in Illinois and the Noyes family would stay there until 1882, though having purchased land in Liberal in 1881. Caroline’s sister, Sarah Ann Lydia Atwell Gilbert, had died in 1877 in Boston. 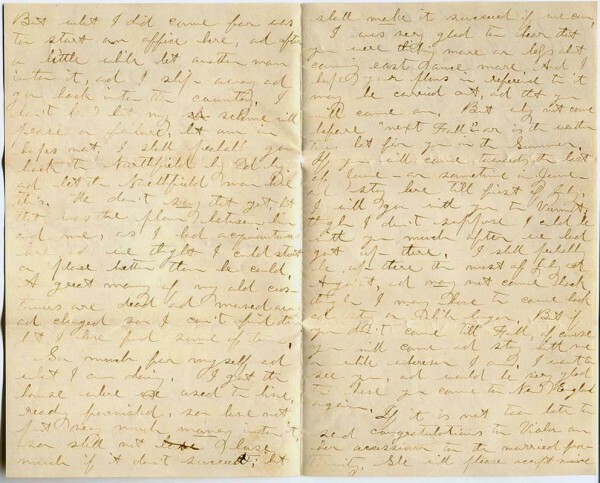 Two years later Caroline was communicating with Sarah’s surviving husband, Norman West Gilbert, that she was interested in making a visit. 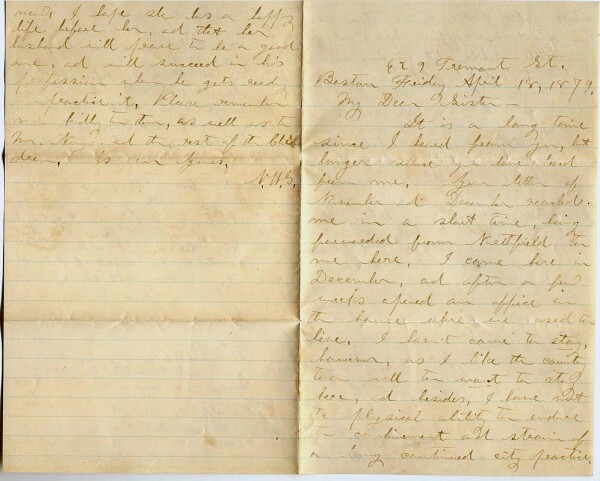 We don’t have her letter but we do have his response, and in it he mentions having been to a seance, which he believed to be a fraud, but the letter seems to at least indicate an interest and perhaps a belief in Spiritualism. My assumption is that he communicated this to Caroline because of her own personal interest, and we know from a later letter from her son, Victor Hugo Noyes, written in 1885, that the family was very interested in Spiritualism. I also know this just from being a member of the family and the passing along of family stories. James Allen Noyes, Caroline’s husband, was certainly a Spiritualist, and associates at Alphadelphia had been as well. My belief is that the Noyes were of a type of free thoughter that saw no conflict between free thought ideals and spiritualism…or even agnosticism, if they were agnostic. The Noyes Family Constitution, written in 1882, at Liberal, shows they were using the dating system advocated by the National Liberal League, which was followed in Liberal. They were no doubt believers in separation of church and state. They were not Christians, and likely felt some stress from immersion in Christian society, else they wouldn’t have moved to Liberal where churches were initially banned. But to say that Liberal was thus only an atheist community and that its turn to Spiritualism was disappointingly against original ideals? I think it’s more likely that perhaps a fair number of settlers instead hoped for a living situation outside the constraints of theisms and codified religion, feeling there was ample room in freethought principles for science residing side by side with an individual belief in some sort of after life and Spiritualism. After all, these believers in Spiritualism partook in the initial settlement of Liberal, sending their children to schools where religion was not taught. O. E. Harmon, a son-in-law of the Noyes, in his book on Liberal testified to this mixed assortment of freethoughters who simply wished to live “unmolested”. He (Walser) had broken away from the Calvinistic religion, and had become a Free-thinker. It dawned upon him one day that it would be a good thing to found a town where Free-thinkers could live in a sort of colony and enjoy their belief in a quiet, unmolested way. Various shades of Free thinkers first settled in Liberal. They ranged from out-and-out Agnostics to the more spiritual minded Deists and Spiritualists. Mr. Walser, himself an Agnostic when he founded the town, became in the course of years a Spiritualist, and there was quite a group in the town minded the same way. Boston Friday April 18, 1879. It is a long time since I heard from you, but longer since you have heard from me. Your letter of November and December reached me in a short time, being forwarded from Northfield to me here. I came here in December, and after a few weeks opened an office in the house where we used to live. I haven’t come to stay, however, as I like the country too well to want to stay here, and besides, I have not the physical ability to endure the confinement and strain of a long continued city practice. But what I did come for was to start an office here, and after a little while let another man enter it, and I slip away and go back into the country. I don’t (?) but my scheme will prove a failure, but am in life’s net. I shall finally go back to Northfield by (?) and let the Northfield man live this. We don’t say that yet but that was the plan between him and me, as I had acquaintances here and we thought I could start a place better than he could. A great many of my old customers are dead and moved away and changed so I can’t find them but I have found some of them. shall make it succeed if we can. I was very glad to hear that you were thinking more or less about coming east once more. And hope your plans in reference to it may be carried out, and that you will come. But why not come before “next Fall” – or is the weather too hot for you in the Summer. If you will come towards the last of June – or sometime in June – and stay here till first of July, I will go with you to Vermont, though I don’t suppose I could be with you much after we had got up there. I shall probably be up there the most of July and August, and may not come back though I may have to come back and stay a while longer. But if you don’t come till Fall, of course you will come and stay with me a while wherever I am. I want to see you, and would be very glad to have you come to New England again. was a cheat and a fraud. I have gathered a little testimony lately, however, that tends to show the spirits communicate, but does not prove it by any means. I am quite strong in my faith in a hereafter, but can get (?) that will remove the everlasting doubt. However, if there is none, we never shall find it out, and nobody can ever prove that there isn’t. Please write me and let me know how you get along, and about your coming east. I suppose you are picking strawberries – or nearly ready to pick them by this time. They are here some now but come from the south. The season is very cold and backward. Has been snowing a little here today, though only a few stray flakes. It rains when it doesn’t snow. That the sunshine will come by (? ).